AFRICA: Ethiopia, Eritrea peace agreement puts nice twist on African politics – WAR MONGER MUSEVENI MUST BE IN AGONY! AL JAZEERA – The peace agreement between Eritrea and Ethiopia is a radical act that will have an impact on all of East Africa. Diplomats from Ethiopia and Eritrea are calling it a “joint declaration of peace and friendship” but that innocuous name is masking what may be one of the most important political changes in East Africa in the past 20 years. With a simple, five-pillar agreement the presidents of Ethiopia and Eritrea, which were once one country but were bitterly divided by one of Africa’s most expensive and devastating conflicts, jointly declared its end. It is very easy to be sceptical of the peace declaration given the region’s history of unremitting conflict and political false starts. The Derg regime, which came to power in Ethiopia in 1974 following the ousting of Emperor Haile Selassie, was supposed to mark the end of imperial rule in the country, but in no time itself became a violent, bloody regime. After fighting a war of liberation against the Derg regime for many years, Isaias Afwerki took control of the newly independent Eritrea in the early 1990’s and swiftly transformed it into a hermit state. In the name of remaining ready for war, hundreds of thousands of Eritreans have been forcefully conscripted into interminable military service. Despite its small population, Eritrea has consistently been producing the largest number of African refugees to Europe for years. Meanwhile, Ethiopia constructed the most elaborate security state in East Africa. Millions of dollars that could have been spent on food security and development have instead been wasted on armies and surveillance, turning citizens into spies and destroying freedom of expression. Therefore, the excitement and enthusiasm with which Ethiopians and Eritreans at home and abroad received the announcement about the end of the 20-year-long African Cold War are understandable. Thousands had been forced into exile as a result of rapid militarisation in both countries, and Monday’s landmark agreement is the surest indicator yet that a pivot away from security-centred statehood is possible. Yet, in the rest of East Africa, some have found it hard to process the news. The Kenyan media, for example, failed to devote any coverage to the event on the day and has only had marginal analysis since, despite the fact that thousands of Ethiopians and Eritreans currently live in Kenya. The changes Prime Minister Abiy Ahmed is pursuing in Ethiopia will have an impact beyond the borders of his country and its neighbour, Eritrea. So how should East Africans especially, but outsiders in general see this peace declaration? Between ending the war and decriminalising various political groups, Ahmed is breaking a network of political taboos that have been a constant hum in the background of east African politics for the past 20 years. Specifically the war between Eritrea and Ethiopia has been a seemingly unchangeable fact in a region that has a long history of protracted conflicts. So even floating peace as a possibility is a radical act of political transformation that changes the scope of what is possible or imaginable within the political arena – this could be the beginning of a major shift in the discourse around peace and security in East Africa and that needs to be acknowledged. Of course, such a move will have political implications beyond this. In Kenya, the Lamu Port-South Sudan-Ethiopia Transport Corridor (LAPSSET) is a major infrastructure project that was developed with the explicit aim of connecting landlocked Ethiopia with the sea. 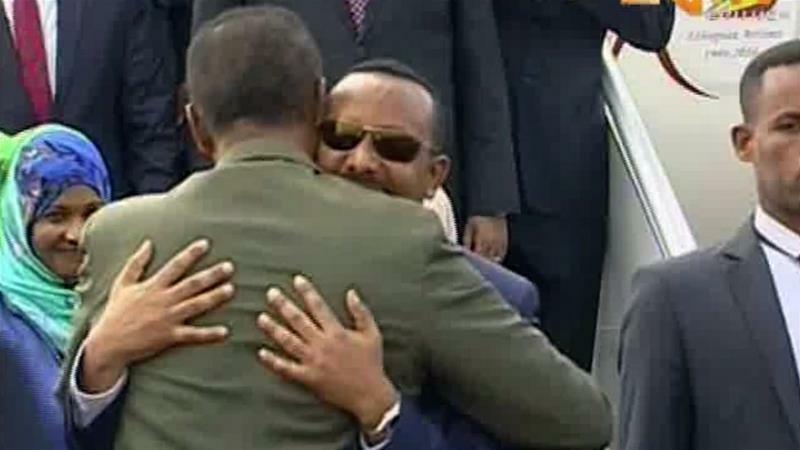 The animus with Eritrea meant that shared infrastructural connections between the countries that predated Eritrean independence could not be used. As the most stable country in the Horn, Djibouti has been a natural alternative for Ethiopia, although recently Addis Ababa has also made overtures to Somalia and Somaliland for the use of Berbera port. Kenya maintains that the LAPSSET project is part of a broader continent-wide North-South, Cape to Cairo transport network, but regardless, the utility of the LAPSSET project and the displacement and disruption it has already created will now be under greater scrutiny following the peace accord between Asmara and Addis Ababa. At the same time, tensions between Somalia and Somaliland about the use of Berbera port will seem less urgent if Ethiopia is able to develop a workable alternative through Eritrea. In June, Mogadishu accused Hargeisa of violating the conditions of semi-autonomy by entering into an agreement with Ethiopia over the development and use of the port, which they argue should have been approved at the federal level. The tension forced Ethiopian diplomats to backtrack on commitments to direct trade through Berbera. With peace between Eritrea and Ethiopia, both of whom stand to gain immensely from normalisation of their relationship, the tension between Somalia and Somaliland will perhaps dissipate, at the very least taking another point of contention off the table. None of this should overshadow the human element of this declaration – the fundamental reason why this matters. Like India and Pakistan, or Sudan and South Sudan, the border war between Ethiopia and Eritrea has torn families and communities apart, particularly those living along the border. The political separation was further entrenched by the severing of communication ties and travel bans, making any dialogue between the citizens of the two countries impossible. As mentioned above, militarisation of public life in both countries has significantly distorted networks of trust within communities and a key hope is that the end of the Ethiopia-Eritrea war will feed into a broader process of demilitarisation in both countries. The images of joyful Eritreans and Ethiopians receiving this news is a reminder that war happens to people and to communities, and the end of war is always cause for celebration for everyone. Of course, it is far too early to make definitive declarations of what the future holds for these two countries. Yet, while cynicism has value in political thought, and especially when history provides ample examples of good faith gone bad, it is important to be as ready to accept good news as the bad. Independently of what happens moving forward, this is a special moment for East Africa that must be cherished and encouraged. For those of us who are neither Ethiopian nor Eritrean, this is a timely reminder that within the politics of a complicated region, sometimes good things do happen.